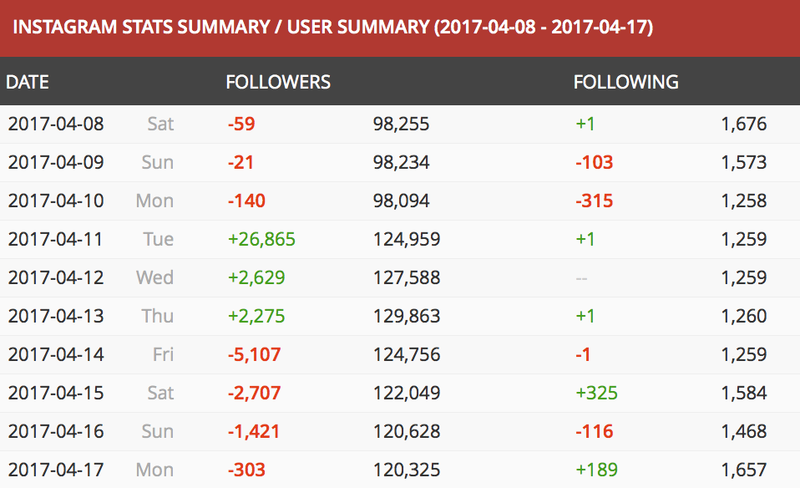 So there is a huge amount of noise right now about people cheating their social media numbers with bots and outright buying followers. And rightly so, because it’s pretty outrageous. Being the blogging world that it is, there’s also a lot of people stirring the pot, making things worse and generally misinforming about this matter. Which quite frankly helps no-one. Naming and shaming does nothing (although I can see the potential satisfaction that could be earned from doing so), and ‘outing’ those who do it or have done it, is also not the wisest thing in the world. Remember, your blog is your brand and your social media platforms are your voice – regardless of what anyone else is doing remember that if you sit online and ‘out’ bloggers, YOU look petty to brands and PR’s. It’s the sad truth, and while it might not be fair, if you make too much noise about something other people are doing then it actually has a negative impact on your own brand. The same can be said for those I’ve seen this morning making comments about being so disillusioned by the negativity, when one check shows they are one of the bloggers indeed using bots. PR tip #1: if you’re doing it right now, perhaps don’t sit and pretend you don’t. Inauthenticity kills your reputation just as much. My personal opinions on this matter aside (yes, I’m as mad as the rest of the blogging world) the other side to this coin is the PR side. The tools people are talking about are Social Blade and the likes – which I’ve been using for a short while in a professional capacity. So for me, this isn’t a new development – these tools have been available for ages. Please don’t now expect brands to suddenly find these tools and blacklist the dodgy bloggers faking their way to the top, and all be well with the blogging world. The sad reality is – in PR, we all already know about these tools and use them to varying degrees. Let’s just hope the noise this weekend has made it a little bit more imperative that PR’s check before signing the big ole cheques and booking those bloggers flights to the Maldives. Obviously the damage that can be done from a PR perspective with faking your figures is that we won’t work with you. If you use bots you’re cheating. Your audience isn’t engaged, they’ve been conned into following you and therefore any sales message or promotion you can deliver is wasted and lacks any real value. So if you’re buying followers or using the follow and unfollow bots, please don’t expect the opportunities to continue forever. And potentially also expect some slightly uncomfortable emails from PR’s who’ve signed you up for campaigns based on your faked figures. Hopefully the more openly tools like Social Blade are used will mean bloggers who fake their numbers will be exposed on a professional level as PR’s check stats a bit more closely. And that’s going to be pretty embarrassing in the short term – and in the long term it will completely break down relationships you’ve built. So while a couple of hundred or thousand new followers a month might make you feel good – it’s actually going to kill your blog. Not just because those bloggers and people following you are now currently sat on their phones checking your stats for themselves, and feeling angry that you’ve lied to them, but also because come the start of your next possible campaign, your PR likely will too. Awkward much? I say this not to be harsh, but to be true. The sad reality is that in the last week I’ve checked hundreds of bloggers on Social Blade – and been completely disheartened by my findings. Bloggers who I never expected to cheat, quite clearly are. Friends who’ve said they find the prospect abhorrent – quite clearly lied to me as they’re doing it too. It’s rife. But does it make you a bad person? No. And that’s something we all need to remember. These people are girls who are so blindsided by getting bigger in the blogosphere, that they’ve forgotten their roots and got carried away. It doesn’t justify it, but the witch hunting is probably a tad over the top. They aren’t bad people – they’ve just got a bit…lost. As a blogger it’s hard for me to say that, I’ve felt the surging boil of anger the past week as I’ve seen who’s using bots. I have never been as unwell as I was with Hyperemesis in January and February and I had to take over a month off blogging. I pushed myself to maintain as little content as I could to stop my blog crashing and burning. It caused tears, late nights wondering if I should give it up completely and a lot of heartache. I clung on to Lady Writes by a thread for those two months. So I feel the anger that all of you feel too – I know how bitterly frustrating it is to find people cheating when you’ve put pure blood, sweat and tears into your own work. But lets not forget that these girls aren’t bad people, they’ve just made some bad choices. Fact: You can organically gain several hundred followers overnight – I was once RG’d by Too Faced and got over 200 new likes overnight. It’s when this happens with bigger figures, or more frequently than a one off, that you can class this as ‘suspicious activity’. Lets not jump on everyone who’s had a bit of luck and been RG’d by a huge brand once and who’s Social Blade account shows a mini hike. It’s kinda the point to an extent. If you want to see the fakes, it’s the ones that jump by more than a few hundred, and sometimes more than a few times. After searching for someone, always pick the ‘Detailed Stat’s’ option underneath their name. From there you’ll find more info and someone who buys followers will have a big jump showing in the bottom graphs. Remember to check the scale, a small blip on one bloggers graph is to their own scale, don’t compare it with the next. One block could reference 100 for one person and 1,000 for another. So pay close attention. A couple of hundred or so, as a one off, probably not so shady (give the benefit of the doubt.) However something like the below may look like a tiny hike but is actually a jump of approx 1,500 followers. Not quite as explainable and obviously some bought followers. What is important to remember is that Social Blade is a marketing tool. Yes, no marketeers and bloggers can use it too, but to understand it you have to think with a marketing head on. That means not over analysing every single dip and hike in the graphs. You must be objective. A ‘clear’ Social Blade account will show growth charts that are generally increasing at a level pace, with the odd scattering of followers and following numbers fluctuating in each direction. We all unfollow accounts we no longer like or want to see, so lets not jump on everyone who unfollows a couple here and there. HOWEVER there is one slight point to mention with that – a blogger who has a steady growth chart that looks even and normal, but shows they use bots (like in the chart above) actually just means that they’ve been using bots for a while, rather than they haven’t used them at all. Remember you can do this for all platforms, but hopefully understanding how to better use Social Blade and read it’s findings will help to avoid mistakes in accusations and to clearly identify those who are indeed cheating the system. Remember though – if you’re one of the many genuine bloggers, who pours their heart and soul into their work, doesn’t buy followers or use bots, then no matter how many people there are cheating, YOU are still blogging with integrity. And I may only be one PR in a pool of many, but to me: I see you, I recognise you and I value you and your integrity above everything else.